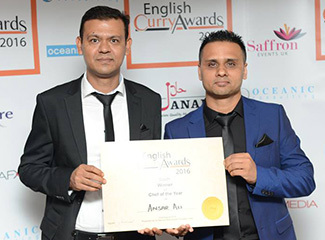 The English Curry Awards recognises and rewards the very best in the curry industry. Your nominations count, we will be proud to represent our customers and our region on the national stage. 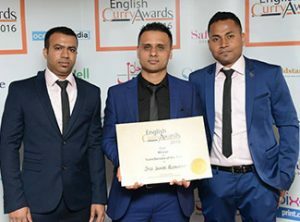 Awarded first place in both the ‘Service of the Year – East’ and also ‘Chef of the Year – South’ in 2016 & Service of the Year in 2017 categories, the Spice Lounge Restaurant received their awards at a black-tie event held in Manchester’s Picadilly. Attended by over 300 guests from across the industry, the awards marked the most eagerly anticipated event on the English food calendar. “Please mention Jueb Ali aka Jay in your nomination if you write about Jay. Also remember to take a screenshot of your reason and post to our Facebook Competition Post, to be entered in our £100 Prize. 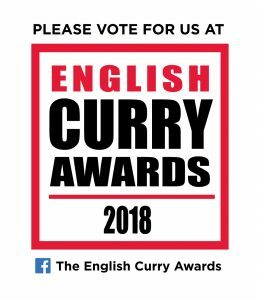 Winner will be announced on 20th August 2018, Live at the English Curry Awards. One winner will be chosen from all eligible entries at random. No change will be given from the voucher, which is eligible for one use only. Voucher will have to be redeemed within 30 days of issue date. Voucher can be used for either eat in or take away. Voucher cannot be redeemed on a Friday or Saturday. Management may change terms and condition without notice. Management decision is always final. Facebook does not endorse or administer this promotion.